The state of early childhood education and care in Canada 2010: Trends and analysis uses data from successive editions of Early childhood education and care in Canada (1992, 1995, 1998, 2001, 2004, 2006 and 2008), developed and published by the Childcare Resource and Research Unit (CRRU) and data available in Public investments in early childhood education and care in Canada 2010, published by the Government of Canada (HRSDC), which is consistent with CRRU's publications in format, content and research methodology. Together these data form a body of longitudinal information that makes it possible to identify trends and developments over time -information useful for research, advocacy and policy-making. 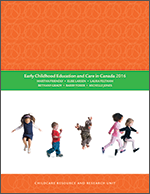 This document considers the ‘state of' early childhood education and child care in Canada during the period 2008 - 2010, using cross-Canada and longitudinal data. The topics and specific data included in this short document are selected from the more substantial information that can be found in the 1992-2008 editions of ECEC in Canada, the federal government's Public investments in ECEC 2010 report, and other identified sources of information available online (which include data sources). AVAILABLE ONLINE ONLY. Download the document in pdf format below.